The most important reason to worry about tread wear is safety. When your tire treads are worn, your car may respond poorly in adverse weather conditions like rain.With good treads your car will grip the road better. Also, having insufficient tread is considered illegal in many states. 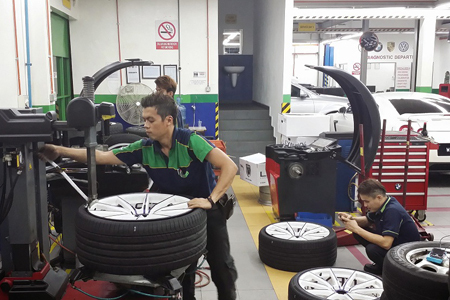 And finally, worn treads can make other parts of your car wear prematurely.When it’s time to change your tires, your Era Maju Automobil Sdn Bhd dealer wants to make purchasing a new set as simple as possible. We have the best selection of quality tires to fit your vehicle, your budget and your driving style.